We offer 20 spacious indoor runs (4’x6’) and outdoor runs (4’x18’) and a large play yard for exercise. 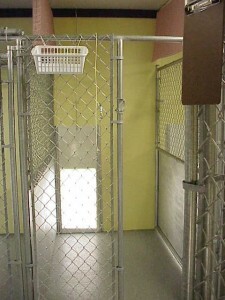 Eight pairs of inside kennels can be connected by lifting a “doggie door” between them. We use these runs for dogs of the same family to be together. Pets have access to their indoor and outdoor run all day, weather permitting. Each pet is individually exercised in the play yard 5 times or more each day. There is a 6’ high perimeter fenced yard that wraps around the kennel where the dogs can exercise. 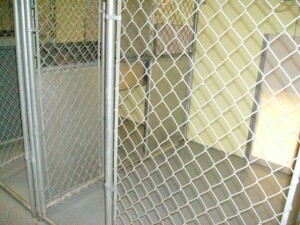 We also offer 5 runs for smaller dogs to have their own area. These runs are 3’x5’ with a doggie door access to their 3’x8’ outdoor run along with their own play yard. We have roof covers over the outside runs. This is especially nice for sunny days or days with light rain. The dogs can still be comfortable inside or outside as they choose. 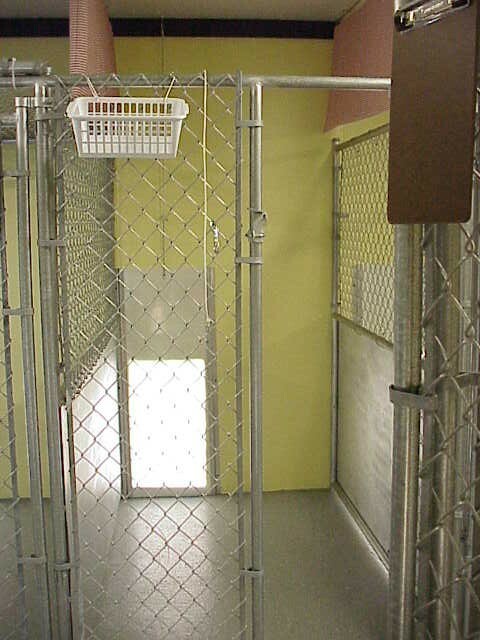 One of our eight connecting kennels. A “doggie door” between them allows dogs of the same family to be together. Access to outside run; weather permitting, doggie doors are left open throughout the day so your pet has access to the outdoor runs. We have a new cat room addition where the kitties can have a turn to exercise. There are kitty trees, shelves and windows for them to enjoy. Cat room photos coming soon!